The holy city of Santiago de Compostela dates back to 5th century, and is not only a World Heritage site, its Cathedral is the final destination for one of the most famous pilgrimages in the world. For thousands of years pilgrims from all over Europe have walked hundreds of kilometres along the Camino routes to this sacred destination where the Apostle St James, is buried. However, this extraordinary city also draws in many visitors because of its wonderful mixture of cultural beauty, welcoming atmosphere and exiting programme of events throughout the year. 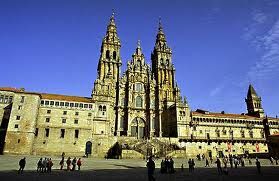 Santiago de Compostela is a relatively small city and therefore very easy to get about on foot. There are guided walks through the Old District, which will give you a flavour of its history and what there is to see. However, the Plaza do Obradorio is the obvious place to start from as this is where the Cathedral is located, but also surrounding the square is the majestic 12th century Gemirez Palace and the Neo-classic Rajoy Palace. According to legend, Apostle James came to the region to preach and convert people to Christianity. In 44AD, he eventually returned to Palestine, and taken prisoner by Herod, who ordered him to be tortured to death. Herod would not allow his body to be buried. So disciples stole the body and sailed off to the Spain. Eight hundred years later the Apostle’s tomb was discovered and a chapel was erected in his honour, which later became the Cathedral you see today. One can only imagine how special it must feel for all those who have made the pilgrimage to reach this special place. Forming a corner of the square next to the Cathedral is the oldest hotel in the world, the Parador Santiago de Compostela (Hotel Hostal dos Reis Catolicos). Built in 1499, it was originally a Royal Hospital and shelter for the exhausted pilgrims after their long journey - a tradition that continues to this day. Now a five star hotel its beautiful cloisters, covered walkways, private gardens, and elegant accommodation makes it one of the most luxurious you will come across. There are also fabulous views from the dining room where you can sit on the balcony and look out over the square. The Praza de Abastos is one of Spain’s largest markets and is the second most visited site. 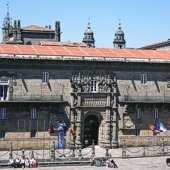 There are also several interesting museums to see, such as the Museo do Pobo Galego and the Museum of Tapestries. You will never be short of choice when it comes to concerts, theatre, film and exhibitions. During the months of May and July the city celebrates with fiestas to honour their Celtic heritage and Holy Week. The trendy part of town in the Plaza Roja, with fashionable clubs and 1920 style cafes. The Rua del Franco is where you will find the more traditional taverns and bars. As for the nightlife, being a University town, it is geared for all ages and tastes, and will take you right through to dawn. Beyond the city is a spectacular drive to the cliffs of Costa do Morte, otherwise known as the Death Coast because of the number of shipwrecks that have happened over the centuries. The coast is made up of large estuaries called Rias, with inspiring views, small fishing towns, beautiful beaches and some of the best shellfish in Spain. There are also a host of exciting activities you can participate in, such as hang gliding, sailing, canoeing, and pony trekking. With thousands of visitors coming to soak up Santiago de Compostela’s unique atmosphere, you do have the convenience of an airport that is only 15km from the city. However, there is also the unforgettable experience of joining the 100,000 people per year who make the Camino routes, on foot, bicycle or horseback, travelling along one of the pilgrimage routes into this holy city – an unforgettable experience that might very well change your life forever.